There is very sad news in the fiery foods world. 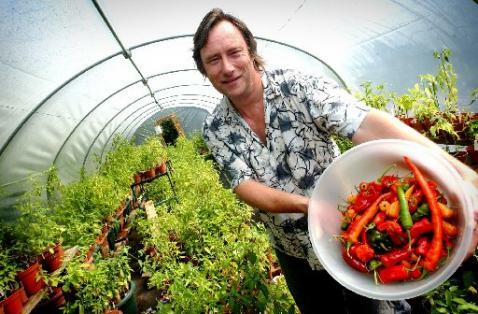 The man very instrumental in helping spread the word about chilli peppers in the UK, Peter Seymour AKA “ChilliPepperPete”, passed away on Tuesday, August 28th at age 56. Peter was diagnosed with cancer three weeks before passing, although he had felt ill for longer. Sometimes known as the “Godfather of the UK chilli industry”, Peter founded the Fiery Foods UK (FFUK) Chilli Festival, the latest of which actually takes place the weekend after next, September 14 – 16, 2012, in Brighton. Although I had never met Peter personally, he and I have exchanged e-mails numerous times. His excitement and enthusiasm that he exuded about chillies and his products was contagious. When his daughter, Rose Seymour, had visited the U.S. a few years back, Pete had her hand deliver some sauces to me, along with a bag pull of naga jolokia chillies, when I attended the Fiery Food & BBQ Show in Albuquerque, NM. Peter is survived by his wife, Miranda, and his four children. Chileheads worldwide are flying the flags in their hearts at half-mast this week. He will be missed.